Tidewater Virginia has a wide range of local seafood available including blue crabs, oysters, shrimp, clams, scallops, striped bass, flounder, sea bass, croaker, spot, and more. Virginia borders the Chesapeake Bay, an estuary where Virginia commercial fishermen harvest top quality blue crabs, oysters, clams, and fish. Off the coastline, ocean seafood is harvested including sea scallops, lobsters, tuna, mahi, striped bass, and other delicacies. 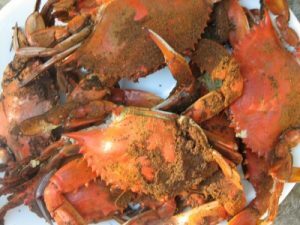 Perhaps the most popular Virginia seafood feast consists of blue crabs, steamed whole and seasoned with a spicy crab seasoning. In addition to steaming, blue crab meat is served in dishes such as crab cakes. Another Virginia delicacy is soft crabs, which are are harvested after shedding their shell and cooked whole while still tender. Soft crabs are served in a number of ways, the most popular being fried and served on a sandwich bun. Virginia is known for its oyster cuisine. The surrounding area has a rich history of oyster harvesting. The James River is among the top Chesapeake Bay estuaries for wild caught oysters, known for yielding especially high quality product. A thriving oyster aquaculture industry also exists which supplies Virginia Beach raw bars, restaurants and seafood markets with high quality oysters. Oysters in the shell are sold by the piece, dozen, peck or bushel. Live oysters in the shell are classified as “small select”, “medium select” or “large select”. Oysters are also sold freshly shucked, in jars or plastic containers by the pint or gallon. Other local oyster products include canned chowders, stews, and soups. Quahogs, or hard clams are prized for steaming or eaten raw. Most raw bars and seafood markets offer a selection of fresh clams in various sizes. In addition to the small steamed and raw clams, restaurants also serve clam chowder and fritters which are made from larger clams. Virginia is one of the top states for sea scallop landings, with most of the scallop boats docking in Hampton Roads ports. When boats make port, the scallops are rushed to market, providing fresh, tender morsels for area diners.